An interactive timeline of the 1987 season. The date was Saturday, Sept. 25, 1987, and the McGill Redmen football team had just dropped its second match against the OQIFC-(Ontario-Quebec Intercollegiate Football Conference) leading Bishop’s Gaiters. McGill’s record was now 1-2. The Redmen hadn’t made the playoffs in six years. But Fuller’s words would mark the turning point for the most incredible team in McGill Athletics history, as the Redmen would go on to sweep their remaining games en route to winning the 1987 Championship Vanier Cup. “I remember, as early as spring camp before the season, what struck me [was] for my first time in all my years at McGill, I looked at our various positions […] and I couldn’t find a weak area,” Gary Kirchner recalls. Kirchner, now a teacher at John Abbott College in Sainte-Anne-de-Bellevue, sounds reflective over the phone. It was 26 years ago that he was the defensive line coach for the championship McGill football team, but it is clear that the season still stands out in his mind. The Redmen entered the 1987 season in the wake of another disappointing year in which the team had failed to make the playoffs. In 1983, a new academic policy at McGill created speculation that the university no longer had a chance at a top-level football team. The resulting flurry of resignations forced Head Coach Charlie Baillie into hiring a new coaching staff. Yet, in an ironic twist, that same year also saw the arrival of freshmen Wayne McRae, Bryan Fuller, and Bruno Pietrobon—key players who would later have crucial roles in helping the 1987 team win the Cup. After starting the season 1-2, Fuller’s prescient speech kicked off what can only be described as one of the most incredible regular season runs in Canadian University Football history. In the games to follow, the Redmen would post staggering triumphs: a comeback win after being down 14-2 at halftime against Carleton, and narrow victories against Concordia, Queen’s, and Ottawa—games which McGill won by an average of only three points. The wins spoke to the tight-knit nature of the team, which returned 44 veterans to the 1987 roster. McRae, now a financial advisor at Wood Gundy in Montreal, remembers the unbelievable display of team chemistry that was on the field every night. “It was our character and [the] maturity that our players had on the team, and how strong we were mentally to win those games [that] made the difference,” says McRae. It started with the “Crazy Dogs”. The bizarrely named offensive line—christened after Fuller’s tendency to feed the players Milkbone Dog Biscuits at halftime—made the local papers and television. Rounding out the locker room personalities were the Power B’s (defensive backs), the Duke Backers (linebackers), and the French Connection (the defensive line). It wasn’t until a pivotal matchup against the Queen’s Gaels in the OQIFC semifinals that the Redmen believed they had a shot. McGill and Queen’s had historically been fierce rivals, but when the games mattered the most, the Gaels always had the Redmen’s number. McGill had not beaten Queen’s in a playoff game in nearly two decades, and at the half, the Gaels seemed poised to extend the streak with a 24-7 advantage. Kesson remembers the game fondly for the team’s halftime turnaround. The Redmen rose to the challenge—McGill managed to score 20 unanswered points in the final 30 minutes to win the game, 27-24. Ring was just one member of the outstanding group of coaches that Baillie had on his coaching staff. Pat Sheahan, that year’s offensive co-ordinator, went on to become the head coach at Concordia, where he led the Stingers to a Vanier Cup appearance. Sheahan is now the head coach at Queen’s, where he won a Vanier Cup in 2009. Ring went on to win his own Cup in 1997 as head coach at the University of Ottawa. Kirchner remembers the staff as a unique combination of committed individuals. Waiting for McGill in the OQIFC championship game were the Bishop’s Gaiters, the team that had given the Redmen their only losses that season. 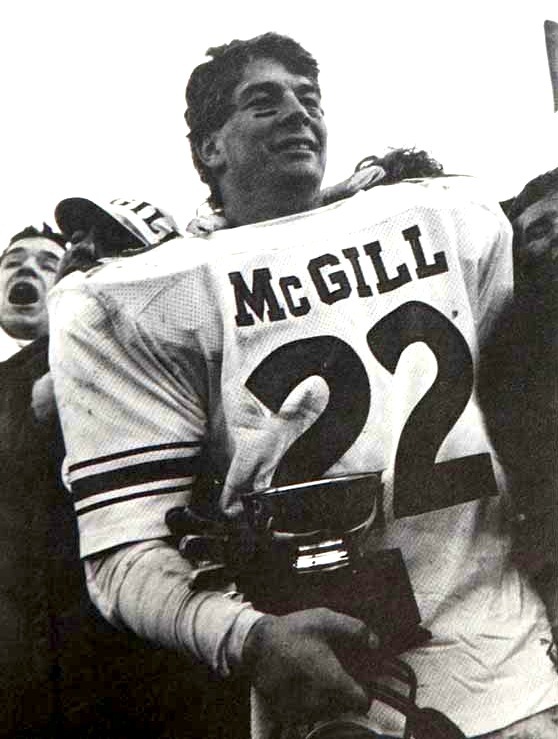 However, McGill flipped the script on the Vanier Cup favourites, beating their conference rivals with ease. The final score: 32-16. The season of destiny continued in the Atlantic Bowl as McGill faced off against the St. Mary’s Huskies for the right to play in the Vanier Cup. The Huskies, led by their star quarterback and future Canadian Football Hall-of-Famer Chris Flynn, held a two-point lead with a minute and a half left in the game. McGill’s ruthless defence intercepted Flynn on a late fourth-quarter bomb, and Fuller brought the offence out for the chance to win the game. They had made it. The Redmen were in the big game that nobody thought they deserved to be in. The 1987 season is surrounded by an aura of mystique because many across Canada believed it to be a Cinderella story come true. Joe Nemeth, then a freshman offensive lineman and now a member of the McGill University Health Centre (MUHC), remembers how the team coolly handled the backhanded comments that wrote off its efforts prior to the championship game. The University of British Columbia (UBC) Thunderbirds—the reigning Vanier Cup Champions—hadn’t lost a game in two years. The Thunderbirds had a high-powered passing attack with which they had racked up points all season. This time, however, they only managed one touchdown on the night—and it was achieved long after the game had been decided. McGill dominated UBC, blowing out the reigning champions 47-11. Soles ran for 203 yards and two touchdowns; Ifill had 122 yards and three touchdowns; McRae returned an interception 67 yards for a touchdown; and Ring designed a defence that simply grounded the Thunderbirds. This was no underdog. This was a team that had out-worked its opponents and would not settle for anything less than the best. It has been 26 years since Fuller made his season-changing declaration. In that time, the McGill football team has failed to reach the national championships, and the program has fallen to the bottom of the RSEQ. No Redmen football team has come close to replicating the success of the 1987 team. McRae, now the president of Friends of McGill Football, understands that today’s league is drastically different from the one that he played in years ago. The 1987 team was a perfect mix of veteran leadership, great coaching, talent, and wild locker room personalities. It was a group of young men that worked hard and refused to back down when faced with difficult odds. McGill students—much as they are today—were impartial to campus athletics back then. However, the incredible 1987 championship Redmen football team transcended the normally apathetic student body and brought the community together in ways that are almost unimaginable today. The Redmen have scheduled reunions every five years, with the team’s 30-year banquet approaching quickly. While the players and coaches from that special ‘87 Redmen team have gone on to pursue drastically different careers, a connection like the one they forged that season is not easily broken. A previous version of this article stated that the Redmen had not made the conference championship since the 1987 win—in fact, the team has managed this twice since then. Rather, the Redmen have not made the national championship since their winning season. The Tribune regrets the error. Maybe the McGill Tribune should check the record books about no other team winning a conference championship since ’87. Oh wait, maybe the 2001 Quebec champs, the 2002 Quebec champs and national semifinalst did! Hi Matt, good catch! We meant to say that no other team had reached the national championships since the 1987 season. This has been corrected in the article—thanks for pointing it out! That game spurred me to join the Trib as a sportswriter and ultimately, columnist, for the paper for the next two years…I wrote a column called the Sports Pit and had an absolute blast with the Trib and CKUT where we broadcasted football, hockey and basketball. My man, Earl Zukerman, was also a huge influence.